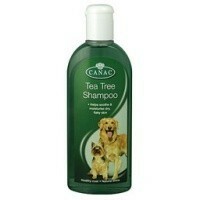 Canac Tea Tree Dog Shampoo 250ml is a fantastic way to moisturise and soothe skin that has been irritated by dry skin or fleas. Renowned for its natural antiseptic properties, this tea tree oil shampoo also strengthens the coat from the roots to the tip, helping to keep your dog's skin and coat in the best condition. Help to repair your dog's skin with this deeply penetrating tea tree shampoo and leave your pet beautifully fresh and clean!